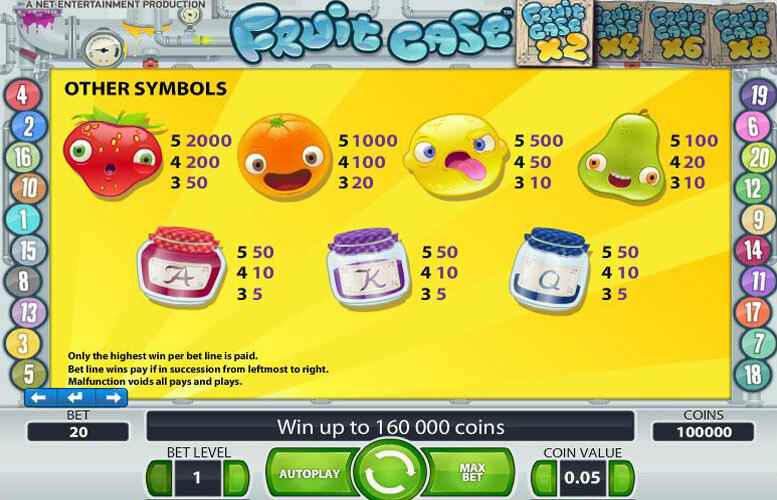 Fruit case is very much a modern twist on what was a class theme for slots. It offers players the chance to win a whopping 160,000 coin jackpot and is played across 20 different paylines and 5 reels. Take it for a spin and get juicing those big prizes! 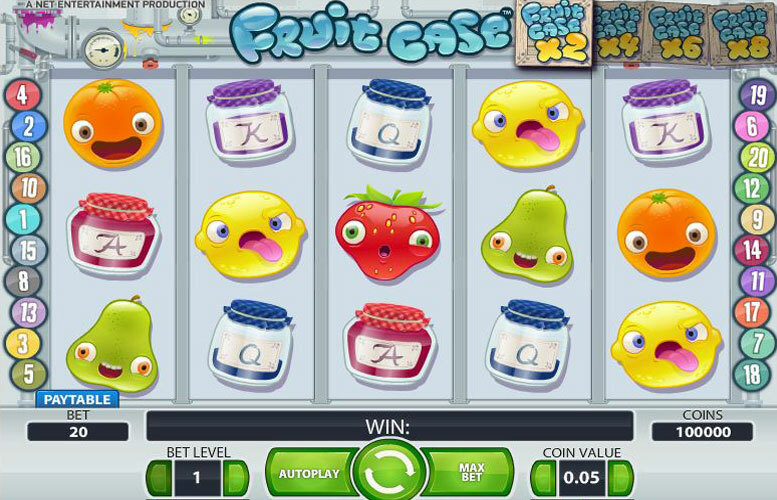 The Fruit Case slots game is themed around a fruit and juicing. It’s definitely a fun filled option with silly faces on all the fruit symbols and funky background sounds. The card icons also appear on little jars of jam which is a nice touch that adds to the overall feel of the game and unifies the theme nicely. There are a lot of fun graphics and animations to watch out for. Fruit will randomly splatter and the jars will explode when you win, which again is a nice touch. For a low-stakes game which caps coin value at 0.50, there is a good amount of opportunity to win high level prizes and the top jackpot is an impressive 160,000 coins. In addition to regular bonus games, there is a Tetris-like feature that swaps out symbols that have already been played so you have the chance to win more. This is the kind of game you could play for a while and we guarantee you’ll be on the edge of your seat waiting to see what’s going to happen with each spin. If you like a unique slot game then this will be right up your street. 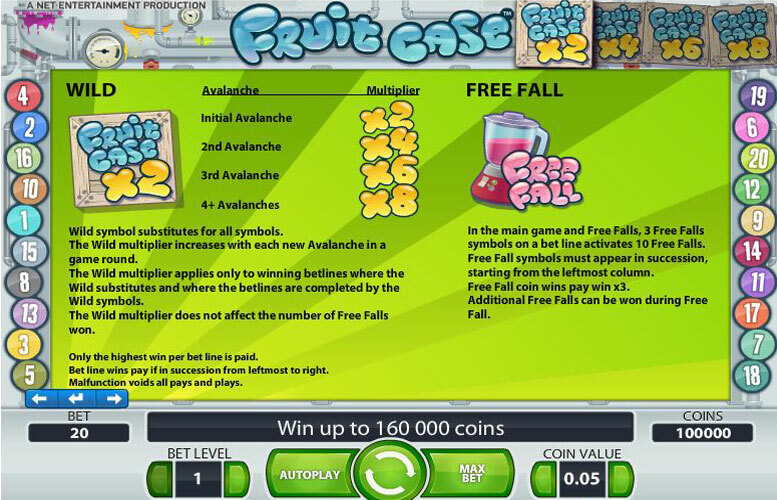 The highest jackpot Fruit Case offers is 160,000 coins. If the maximum betting level is enabled this will equate to £80,000. For a strictly low stakes betting platform, this prize is incredibly high. In order to win the highest possible prize you will need to earn bonus rounds or earn additional pairs when the free fall play is enacted. These happen fairly frequently so there is a lot of potential for additional prizes with each spin. Once the free spin play begins the player is dependent on luck to see how much they are going to win. They will get a set amount of spins which will allow them to earn higher winnings. Additional bonus games can also appear during this period, which will increase the amount that will be compounded onto your winnings. Betting ranges between 0.01 and 0.50 coins for each bet. You will have the choice of enabling up to 20 rows to increase the chance for bonus pieces to appear. Because the value of the coins is directly tied to the amount the player is betting, you will need to enact the highest possible betting amount to earn the maximum jackpot in this game. There are 10 bet levels to choose from so you can crank this slot right up if you want to. The key to successful betting in this game is enabling plenty of rows where the free fall icon can appear. Because this symbol is progressive, you can continue earning free “spins” without having to use another turn, which allows your winnings to be compounded without adjusting your bet or having to take additional turns. Since any icons that create matches are crushed, you cannot lose out on your beet for a turn because you have run out of room. Fruit Case Logo – These count as the wild for the board. They can replace any symbol on the board. If your “spin” produces multiple symbol avalanches, the multiplier on the wild logo increases from 2 to 4, 6, and 8. This multiplier, however, will only be applied to combinations that include the wild. Free Fall – This causes random symbols to start falling in avalanche form. Up to 10 free falls can be enacted on a given pay line. All winnings are given a multiplier of three during this game. You can also earn more free falls while the game is in play to continue to earn higher winnings. Pears – these can be matched in formations of 3, 4 or 5 to win prizes (lowest payouts of 10, 20 & 100). Oranges – allows the player to win 20, 100 or 1,000. Strawberries – highest paying set at 50, 200 & 2,000. Cards – The cards in this came appear as jam jars. Jack through Ace are available and can be matched in increments of 3, 4 or 5 to increase your winnings by 5, 10 or 50. This game has a rating of 3 / 5 with 422 total reviews by the users.